Wordgo is a free word game that you can play on the internet with a friend. However this game only supports up to 2 players and there are no bots available to play upon. 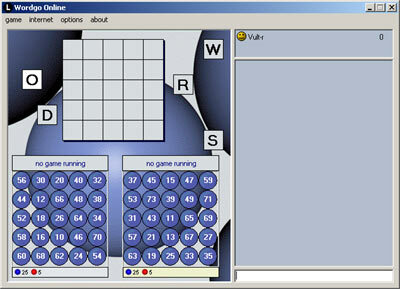 The game can be played in 2 modes: classical word game or full chart word game. A free multiplayer mode is included in the word game. Please take a look at this list with the most important options for this free word game. It will give you a detailed description of the word game you can download from the website. - Play with 500 words english or dutch. - Make your own word games up to a total of 1000 words!. - Extended options to customize your words. - Random game data and events. - Supporting up to 2 players head to head. - Two multiplayer word game modes: classic or full chart. - free multiplayer game using internet. - Free word game with multiplayer mode. This is a screenshot of this free word game. The screenshot is resized to fit on the website. The size of the actual game is bigger.